Family Literacy Day was created by ABC Life Literacy Canada in 1999. This day reminds us of the importance of involving families in life-long learning and literacy activities. Celebrated across the country in schools, libraries, homes, and community centres, Family Literacy Day is an opportunity to share in the joy of reading, writing, listening, speaking, viewing, and representing. 2019 is the 20th anniversary of Family Literacy Day! Although the activities below focus primarily on reading, writing, listening and speaking for Family Literacy Day, we do recognize the importance of including digital literacy in our classrooms. You may wish to refer to the November activity bursts specifically related to National Media Literacy Week. 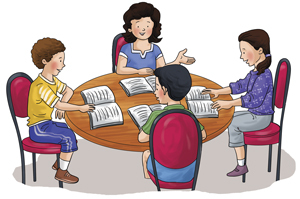 Open a discussion with students by asking them to tell you about their favourite story or book. Share several examples. Read a story-book to the children and ask them what they liked about the book. Ask students who usually reads to or with them: parents, care-givers, siblings, etc. Take them to the school library to pick out a book that they would like to share with their family. Once the books have been signed out, invite students to talk about why they made that selection. Send the books home to be shared and upon their return, talk about who read the books together and what they liked about the experience. Also encourage sharing books in other languages! Note: Some children may not have anybody at home to read to them. Consider setting up a “reading buddy” arrangement for these students. For more ideas, check out these activity ideas. In a newsletter home, identify that you and your class are celebrating Family Literacy Day. Invite families to share their own favourite books, stories, or anecdotes from their families. Ask family members to comment about the experience in the students’ shared Agendas. Provide time in the classroom to share the Family Literacy time the students had at home. Would you rather read a story or book yourself or have someone read to you? Why? Note: Speak to your ESL or Language specialist to see what resources you have available in different languages. Encourage all cultures to bring in samples of what they read in their homes. If possible, connect ESL students to someone in the school who speaks the same language so that they can communicate the importance of Family Literacy Day in any language! Discuss the elements of language with your students. Ask them to identify the different components of language. Explain that reading, writing, listening, speaking, and what we call viewing and representing are important components of language. Share the information in the Introduction (above) and explain that literacy includes all the ways we receive and communicate meaning; improving our literacy helps us become good at communicating with others. Discuss with students how they communicate with each other and with their families. Do they communicate differently with their friends than they do with their families? Why, and in what ways? What means of communication do they use with different people in their lives (phone call, texting, email, online video calling, voice, pen or pencil, art, music, photos, etc.)? Invite students to choose a form of communication and connect with someone. The task will be to share (in a way of their choosing) how they feel about technology and how it can be used to help people communicate effectively.